I first encountered Swoon peering out at me from a black doorway near the corner of Chambers Street and West Broadway during my senior year of high school (2005) on the way to my afterschool job. It was a print of a thin man who sort of stared out at the street from the corner of his eyes; a man who looked as if he were simultaneously emerging from and receding into the doorway. Amid the pedestrian traffic, I stopped and stepped closer. Even more impressive, I was delighted to discover, was the intricate level of detail in the print: a Chinese imperial roofed building had been integrated into his shoulder, and opened up further down into a street scene with dozens of people where his torso and legs should have been. 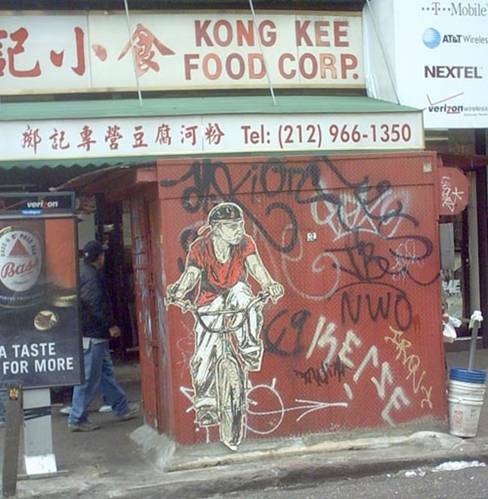 The detail was stunning and the piece poignantly echoed the Chinatown community less than a mile away. Every day for about a week, I would cast admiring glances in its direction, stopping to look more closely if I had a few minutes to spare. Part of me hoped that other pedestrians would see me stopped and take a few moments themselves to look at this work of art (but aside from a few rather suspicious sideways glances, that never happened). The paste-up became more and more ragged until one day, some thoughtless tagger scrawled a red mark across the man’s face and chest, completely blocking the intricate details that I had fallen in love with. I was almost relieved when, two days later, natural conditions left it in tatters and barely recognizable as the work it once was. After four years, I still couldn’t stop thinking about that man in the doorway. And so, during my senior year of university four years later (2009), for my Folk and Outsider Art History Seminar, I decided to finally figure out who the mysterious figure in the doorway was, and that I would do my research paper on his equally mysterious creator. Google led me to Swoon, an artist who had moved to New York City for art school, and had become inspired by the rich street art scene. Her objection to the sedentary, institutionalized, and archival nature of academic art fueled her decision to create art using non-archival materials within a context that not only promoted the decay of the piece but allowed it to interact with its environment and reflect its community. 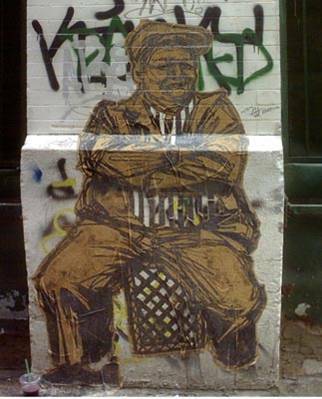 Since 1999, Swoon has been a prolific street artist, and her wheatpaste newspaper prints and intricate paper cutouts could be found in various corners of New York City, as well as in Philadelphia, New Orleans, San Francisco, Cuba, London, Berlin, and a number of other European cities. 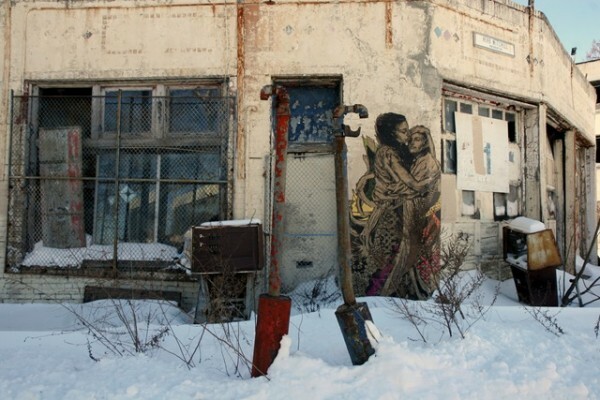 Swoon has worked with various artist groups and collectives including Toy Shop, Glowlab, Black Label, Change Agent, the Madagascar Institute, the Barnstormers, Justseeds, and is a founding member of Miss Rockaway Armada. 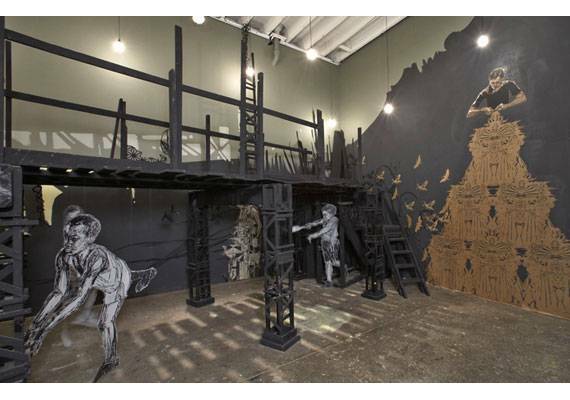 In the summer of 2005, Swoon was granted her first solo exhibition at Deitch Projects, where she installed her collection of wheatpaste prints and cutouts and transformed the façade of the building into a sprawling cityscape. Since then, she has shown internationally, both inside the institution and out on the street, and has become widely recognized as one of the foremost female influences in the international street art scene. More recently, her 2008 exhibition of paper cutouts called “Portrait of Sylvia Elena” in alternative Chelsea exhibition area Honey Space memorialized one of the first victims in the widespread killings of young women in Juárez, Mexico. Aside from her prints and cutouts, she has taken part in several homemade flotilla projects, including “Swimming Cities of Serenissima” in 2007 down the Mississippi; “Swimming Cities of Switchback Sea” in 2008 down the Hudson River and up the East River from Troy to Deitch Studios (at which she had an accompanying installation); and “the Clutchess of Cuckoo” in 2009 from Slovenia (in boats made of New York City garbage) to crash the Vienna Biennale. 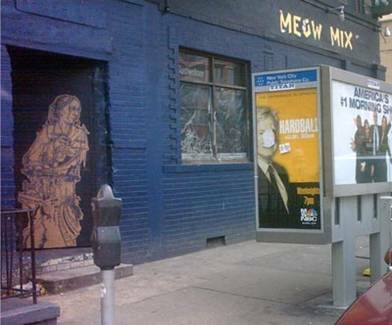 But most recently, Swoon has returned to her roots in street art by posting up her wheatpaste cutouts on the streets of northern Philadelphia for Philagrafika 2010, a printmaking festival. Her recent publication Swoon (released May 2010 with an accompanying exhibition at Urban Art Projects in Brooklyn), which documents her prints as a street artist, finally revealed her real name to the world (it’s Caledonia “Callie” Dance Curry). Additionally, several of her pieces have been acquired by the Museum of Modern Art and the Brooklyn Museum of Art in New York City. But throughout her success, her mission remains to make her art available to the public and to create a community in which its occupants are in constant dialogue with one another, or at least taking an active interest in their public spaces. Although she has partaken in numerous projects since her arrival on the street art scene, it is her life-sized wheatpaste newspaper prints and intricate cutouts that initially gained the attention of the art world. 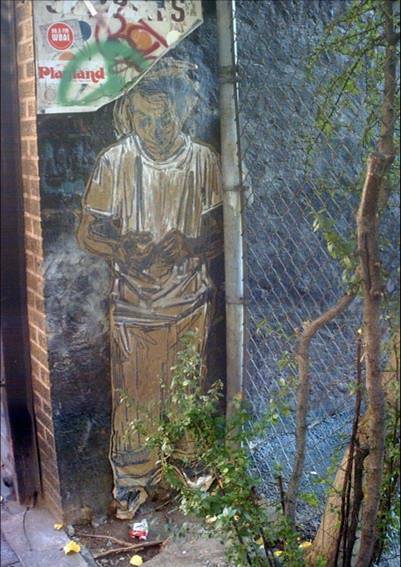 Swoon’s prints can most frequently be found in the forgotten corners of otherwise obvious public spaces. Despite this, she picks her spots carefully, exploring neglected space and walls with interesting textures. Her backdrops include abandoned buildings, rundown warehouses, and broken-looking walls. Because she is interested in the history and texture of the wall, this feature is not hidden, but rather enhanced by the thin newsprint paper. Also, with her cutouts, the figures are intricately cut to reveal the wall that they rest on. This opens up a dialogue between the artwork and the wall, as it works to reveal the wall’s material and history (previous tags and works). When she first began creating her block print posters, Swoon was heavily influenced by Gordon Matta-Clark, an American artist best known for his temporary site-specific works, specifically his “building cuts,” a series of for which he removed various sections of floors, ceilings, and walls in abandoned buildings in the 1970s. Because these buildings were slated for demolition, only a limited number of people would be able to see it. 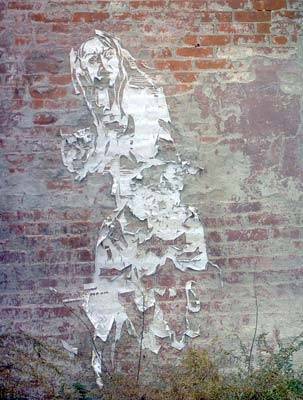 Similarly, Swoon’s wheatstarch newspaper prints can only survive for a relatively brief period, as they are exposed to the elements. Swoon understands that because of the fragility of her materials and the exposure to weather conditions, the pieces will soon disappear completely from the wall space. The classification of Swoon’s art by its materials (newspaper and wheatstarch paste) are of particular importance because they stress the temporary quality of the work. She does not consider what she is doing illegal, and instead pastes her prints up unabashedly, sometimes in the middle of the day, which allows passersby to interact with her as she is hanging them, inviting a performance aspect to her piece. In spite of this impermanent aspect of her work, is it classified under the same category as permanent defacement of property. But for the brief time that the print does remain, Swoon wants them to become part of the space they inhabit, and to interact with its community in “a human way.” And so, these life-size prints of people work to reclaim the visual landscape and to create dialogue and interest in the community through their presence. Additionally, because the works are based on snapshots of everyday city life, they create a dialogue between the viewer and the happenings of the city around them. For example, one piece with the man sitting on the box is based on a time that Swoon saw a man ticketed for the illegal use of a milk crate, which he was sitting on in the middle of the street. Swoon thought this was ridiculous, because people should be able to use the streets as public spaces. This, she feels, is equivalent to encouraging the people to not use the streets as public spaces. With this in mind, she immediately went to work pasting up men on milkcrates around the city. It has been argued that community has been a casualty of the contemporary urban lifestyle. In urban settings, most people live without any sense of rootedness or belonging. Therefore, many cities seem not to be communities at all, but mere agglomerations of transient strangers. As with prison populations, those of us who live in cities have perfected the art of minding our own business, being disinterested, not making a fuss, and not maintaining eye contact for long. This disassociation is reflected in our lack of use and care of our public spaces. Street art works to defy this mentality that we’ve created for ourselves. It challenges us to take back our space and become active participants in the public realm. It challenges us to stop and stare. Swoon has long been one of my favorite street artists because she uses her paper people to revitalize the communities that they inhabit. Through her artistic vision and expression, Swoon attempts to create a dialogue among community members about urban living, space, life, and meaning. Through the dynamic materiality of her life-sized subjects, she creates a dialogue between herself and her audience, and between her audience and her works. In this way, Swoon transforms disassociated and ignored public spaces into places and increases interaction with aspects of the urban landscape which would otherwise go unnoticed. By adding a temporary character to places we otherwise might have overlooked, she simultaneously reminds us to not take our surroundings for granted and that we have the right to enjoy our public spaces. I haven’t provided many links to particular sites because Swoon’s been pretty widely written about. There are tons of photologs, articles, and interviews out there, so if you’re interested, get Googling! Thank you for writing this great article about Swoon. She is a great and fantastic artist.